A Video FAQ Series answers your business’ most frequently asked questions. You know, the same ten to fifteen questions that you, your staff, and your sales team answer over and over again every day of the year. 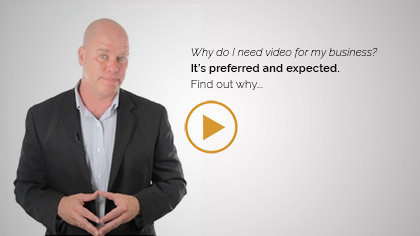 How much valuable time would you save if you were to answer prospects' questions with video? Stop and think about that. Get out the calculator. We did. You’d save over a week a year -at a minimum. But honestly, it’s not about you. It’s all about your prospect’s behavior and what they need. The reality is that most of your prospects are doing their own research before they ever contact you or make a purchase. You know prospects have questions. You have the answers. So why not provide answers to their questions with videos. You answer questions well in video and you’re going to be trusted and remembered. Think about your sales funnel or the buyer’s journey. In either model, you’re trying to move your prospect along in their thinking toward the point of sale. You need to provide information, overcome objections, and help prospects get past their emotional stop sign, doubt. Answering questions anticipates objections and removes doubt. Answer enough questions and your prospects will be ready to pick up the phone, fill out a form, or make a purchase right there and then. We’ve pioneered the Video FAQ Series in our industry. It’s our proof of concept. Watch the videos that interest you. Think about how your own business would use a Video FAQ Series. Consider which questions you’d answer for your prospects. How would your visibility in search and your inbound traffic increase? What’s the value of being considered the authority in your industry? Take a moment to envision the impact on your sales. Prospects are out there right now searching the web on their laptops, tablets and smartphones. In fact, more and more people are using their voices to ask Siri, Cortana, and Alexa to answer their questions. Thought of a question that might appeal to you. We know what you’ll find. It’s not a party trick. It’s by design. Know this: Your most valuable marketing assets are the questions you answer every day. We understand your questions. We provide the answers you’re looking for. We can help you do the same for your prospects.